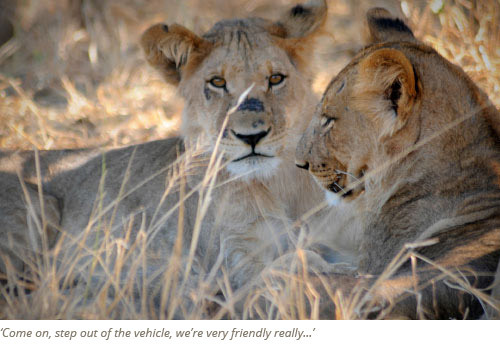 We have been organizing mobile safaris in Botswana for over twenty years. We know the country like the back of our hand and can introduce you to some very special places off the beaten track. Botswana is one of the last places in Africa to be truly wild and unspoilt – you can drive for hours and not see another vehicle. The parks aren’t fenced and neither are our camps – this is wild Africa. 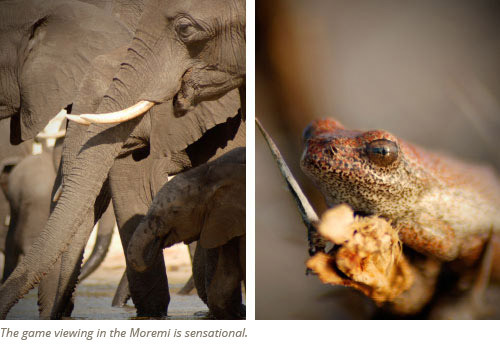 We can plan a safari to just about anywhere but the majority of our adventures take place in the Moremi Game Reserve, the Chobe National Park, the Central Kalahari Game Reserve, and Nxai Pan National Park. We have pre-organised group safaris with set start and finish dates that you can join – the more people the cheaper the trip, or we can put together very reasonably priced bespoke private safaris to suit your dates and dreams. The delta is one of the world’s largest inland water systems. Its headwaters start in Angola where numerous tributaries join to form the giant river Cubango which then flows through Namibia (where it’s called the Kavango) and finally enters Botswana (where it’s known as the Okavango). Millions of years ago the Okavango river used to flow into a large inland lake called Lake Makgadikgadi (now Makgadikgadi Pans). Tectonic activity and faulting interrupted the flow of the river causing it to backup and form what is now the Okavango Delta. This waters from Angola eventually spill out over the dry Kalahari sands creating a unique system of waterways that support a vast array of wildlife in what would otherwise have been a desert. The floods only cross the border between Botswana and Namibia in December and will only reach the bottom end of the delta (Maun) sometime in July, taking almost nine months from the source to the bottom. This slow meandering pace of the flood is due to the lack of drop in elevation, which slopes a little more than 60 meters over a distance of 450 kilometres. The delta’s water dead ends in the Kalahari with over 95 per cent of the water eventually evaporating. During the peak of the flooding the delta’s area can expand to over 16,000 square kilometres, shrinking to less than 9,000 square kilometres in the low period. As the water travels through the delta, the wildlife starts to move back into the region. The areas surrounding the delta are beginning to dry out (the rains in Botswana occur approximately the same time as in Angola) and the wildlife starts to congregate on the edge of the newly flooded areas, May through October. The best time for game viewing in the delta is during the May-October period, as the animal life is concentrated along the flooded areas and the vegetation has dried out. The best time for birding and vegetation is during the rainy season (Nov - April) as the migrant bird populations are returning and the plants are flowering and green. To enjoy all the delta has to offer you can join one of our upcoming trips, you can book a private safari package, or contact us to plan a bespoke safari that combines all the areas you want to visit. There is also the option to explore the waterways that in comprise the delta in a traditional dug-out-canoe called a Mokoro. These water-based adventures run as day trips from our Maun base or as one, two or three-night Mokoro Safaris where you camp on stunning islands and explore by water and by foot. 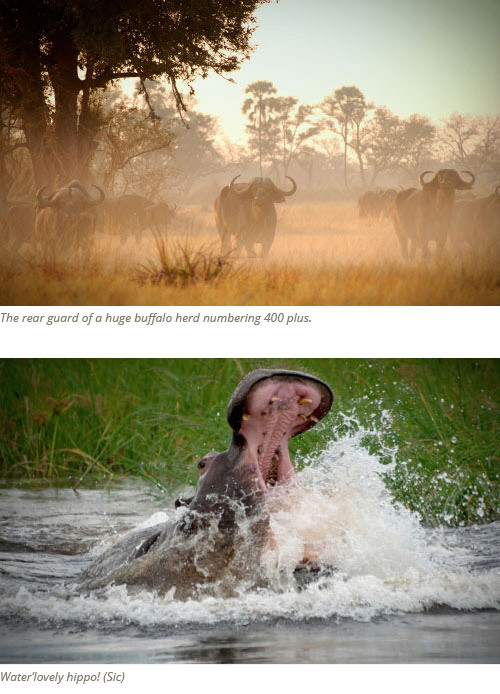 The Moremi Game Reserve is situated in the Okavango Delta. It is a very beautiful region with lagoons and rivers, wide grasslands, cool tall Mopane forests, lush riverine woodlands and acacia savannah. 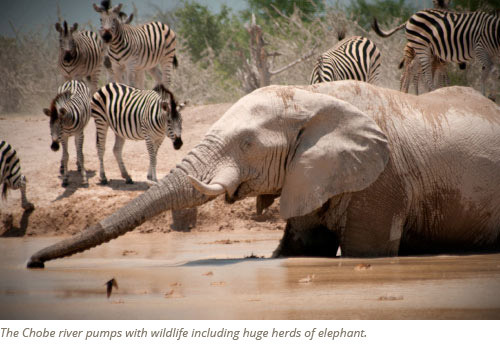 The reserve is home to an enormous variety of wildlife including huge herds of elephant. Created in 1963, it was the first wildlife sanctuary to be established solely by an African tribe. Since it’s creation the tribe and the government have increased it’s size to an area covering close to 5,000 sq. km of the Okavango Delta. The Reserve is renowned for it’s diversity of flora and fauna, not to mention the peacefulness and beauty of the area. You are miles from civilization - this place is not to be missed. To experience the Moremi for yourself you can join one of our upcoming trips, you can book a private safari package to the Moremi, or contact us to plan a bespoke safari that combines all the areas you want to visit. 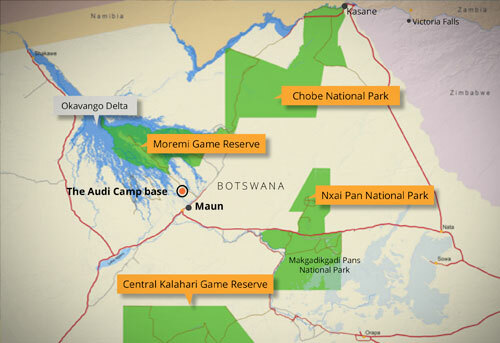 Chobe is situated in the far northeast corner of Botswana. It covers a variety of vegetation types and geological features which vary from the desert like landscape of Savuti to the lush Chobe floodplains. Chobe is famous for its abundance of elephants, one of the highest concentrations in Africa. It is also the most southern point in Africa where the Puku antelope can be found. The trip from Maun to Kasane (on the far side of Chobe) is a true bush-bashing experience, with dusty, bumpy roads, game all around you and a feeling of being a million miles from civilization. Once again there are no telephones, televisions, newspapers, petrol stations, shops, or traffic. You can join one of our upcoming trips to the Chobe National Park, you can book a private safari package which incorporates nights in the Chobe and nights in the Moremi Game Reserve, or contact us to plan a bespoke safari that combines all the areas you want to visit. The Central Kalahari Game Reserve (CKGR) is situated in the middle of Botswana and is the largest game reserve in Southern Africa. It is also one of the most remote and unspoiled parts of Africa. The Kalahari is not a true desert. It has relatively low rainfall but is quite densely covered with vegetation and grass, shrubs and trees occur in great variety. The Kalahari gives you the true feeling of Africa with vast open spaces and beautiful clear nights – ideal for viewing the magnificent southern hemisphere constellations. There are numerous desert species here that have made unique adaptations due to the lack of water in the area. The CKGR experience is like nothing else in Botswana. There are designated campsites, but no facilities whatsoever. All water has to be carried in so don’t expect to stand under a shower at the end of the day! Conditions can be extremely hot especially in the summer months. It cools down at night and temperature variations can be sometimes as extreme as 30 degrees Celsius. You can join one of our upcoming trips to the CKGR, you can book a private safari package, or contact us to plan a bespoke safari that combines all the areas you want to visit. Nxai Pan is the transition area between the Delta and the Kalahari, where you will see both wetland and dry land game species. 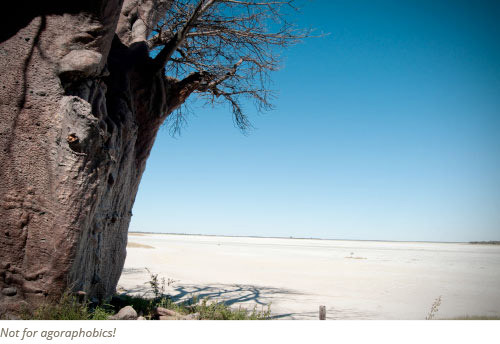 The Nxai Pan National Park also encompasses the famous Baines Baobabs and is connected to the Makgadikgadi National Park. Bains Baobabs are situated on the edge of a magnificent Pan where you can spend your nights. On one of your nights we can arrange for Paul Sheller, an expert on the African night sky, to join you. With no light pollution and a large telescope this is an experience not to be missed. Join one of our upcoming trips to Nxai Pans and Baines, or you can book a private safari package, or contact us to plan a bespoke safari that combines all the areas you want to visit.